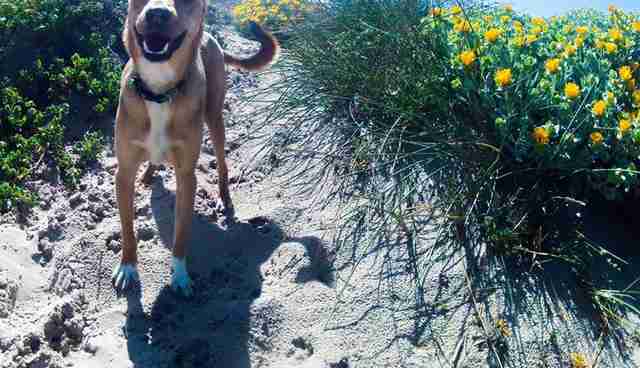 His personality changed as soon as his paws hit the sand. Bailey had never been to the beach before. In fact, he'd never really been anywhere. 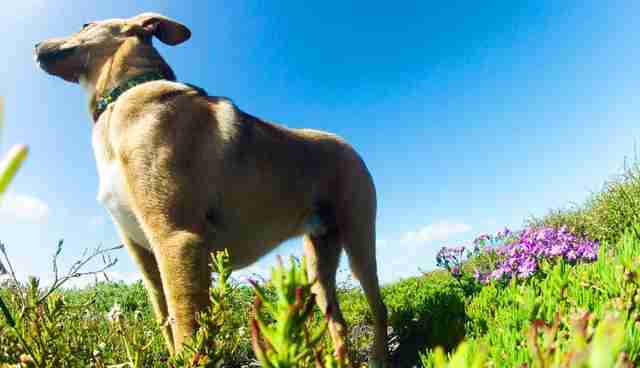 The 9 month-old dog had been born in Blikkiesdorp, a township in Cape Town, South Africa, where some of the city's poorest people reside. Life is tough here - people live in shacks constructed from scrap metal, tires and old pieces of wood. The nearest health center is a mile and a half away, and the city is plagued by violence. It's common for people to keep dogs and cats as pets in Blikkiesdorp, but it's hard for them to give their animals proper care because of the extreme poverty they live in. 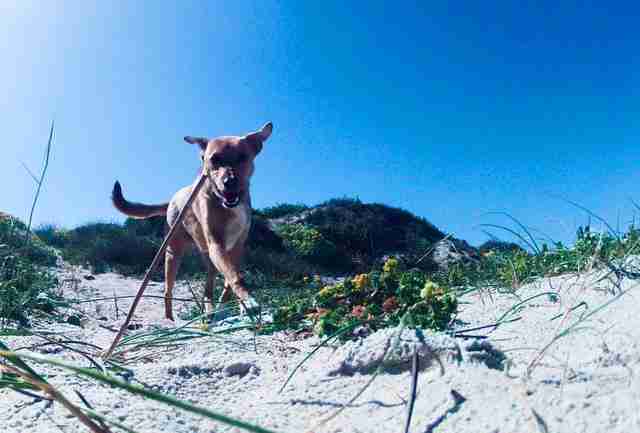 Bailey and his siblings, Simba and Naomi, would scavenge for food in Blikkiesdorp, ripping open bags and sniffing around garbage heaps. The puppies often got diarrhea from their poor diet, and they'd unintentionally make a mess in the owner's tiny yard. The owner's son would scold the puppies, and sometimes give them a beating. 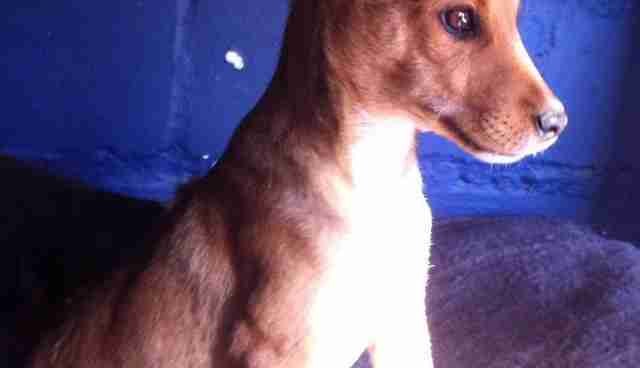 When Bailey, Simba and Naomi were eventually surrendered to Tin Can Town, an organization that helps domestic animals in Blikkiesdorp, the puppies were skinny and riddled with parasites. They were also petrified of people - especially Bailey. For the first month, he'd urinate anytime someone touched him. Clarina Hanekom, a volunteer for Tin Can Town, came up with a solution: cuddles - lots of cuddles. 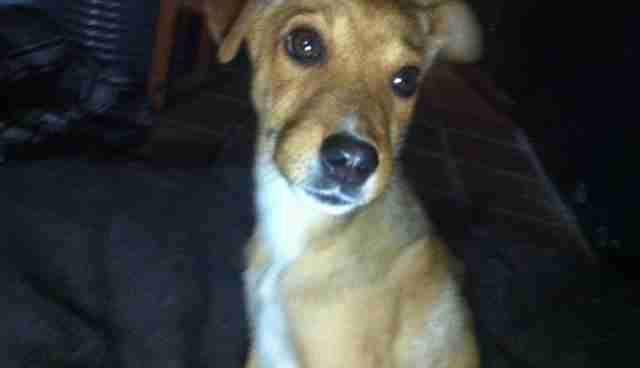 "Bailey's 'punishment' for being scared was cuddle therapy," Hanekom told The Dodo. "After breakfast and after dinner, he was cuddled on our laps and told how awesome and beautiful and clever he is. This ritual continued to the point that he would seek out a lap to get onto after he ate for his cuddle therapy." When Bailey gained more confidence, he was put up for adoption. 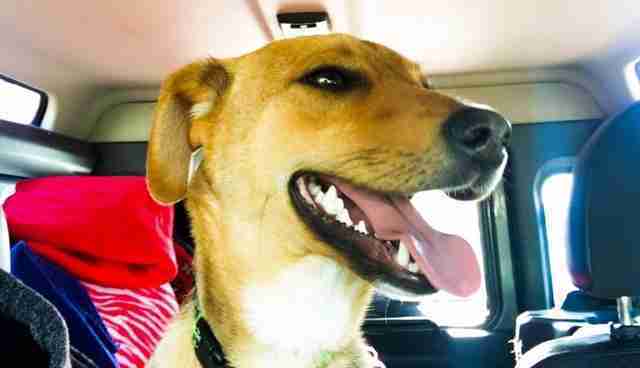 Within a few days, a single mother with a young son asked to take Bailey home. Rosie Kunneke, Dinielle Stöckigt and Hanekom, the founders of Tin Can Town, were ecstatic. "We thought he'd be in heaven in their gentle hands," said Hanekom. "But three months later, this once loving mother threatened to take Bailey to a kill shelter if we didn't come fetch him immediately." According to the woman's messages, Bailey was "destroying" her house, which didn't make sense to Hanekom and the others. 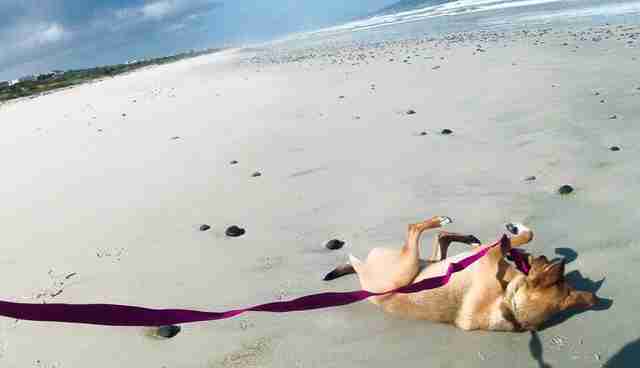 When the woman revealed that Bailey was scared of the leash, they quickly figured out that she never walked him - ever. This seemed to explain a lot. "Rosie and Dinielle rushed to rescue Bailey again, and put him up for the night at the 24-hour vet facility," said Hanekom. "I went to him the next morning on my way to work, and just uncontrollably sobbed when I sat in front of his cage. [I] opened the door and he crept onto my lap for his cuddle therapy." As they searched for a more suitable home for Bailey, Stöckigt decided to take Bailey on a trip to the beach - his first. Initially, Bailey was scared, especially during the car ride. He flattened himself against the seat, only taking little peeks out the car window before crouching down again. 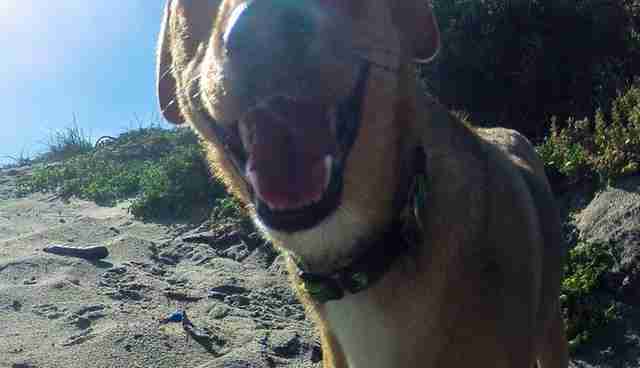 But once Bailey's paws hit the sand, everything changed. 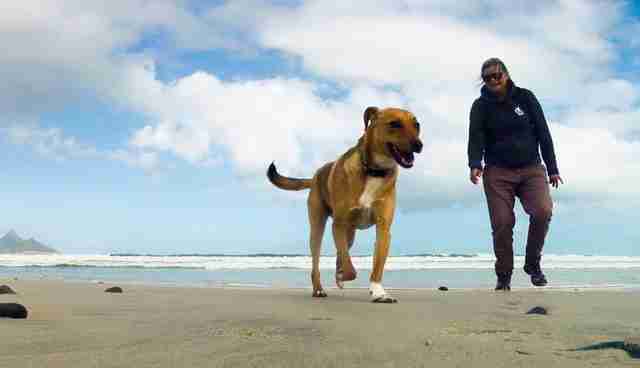 "I took off the leash so he could play freely on the beach," said Stöckigt. "He was just silly as a dog can be. 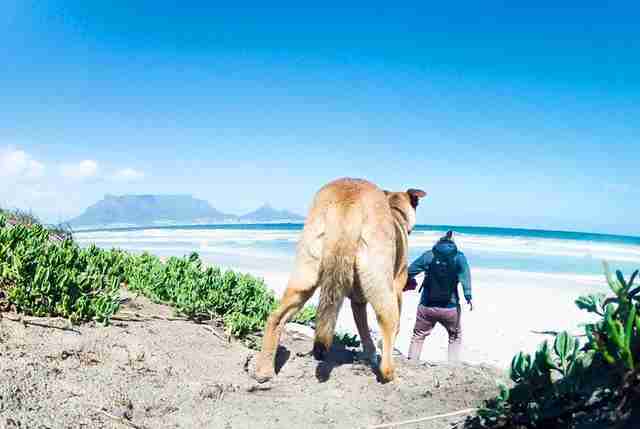 He sniffed the flowers, bushes, dug holes, rolled in the sand, ran up to the surf and would sprint back as the wave hit the beach." 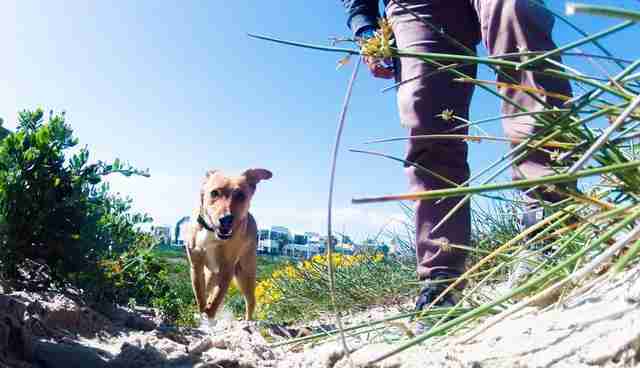 "He would chase me through the dunes as I would try and play hide and seek. He won every time." Bailey and Stöckigt also shared a picnic on the sand. "It was the first time he took food from me," said Stöckigt. "He was just a happy puppy, his past struggles all forgotten, I'm sure." Bailey had such a nice time; he didn't want to go home. 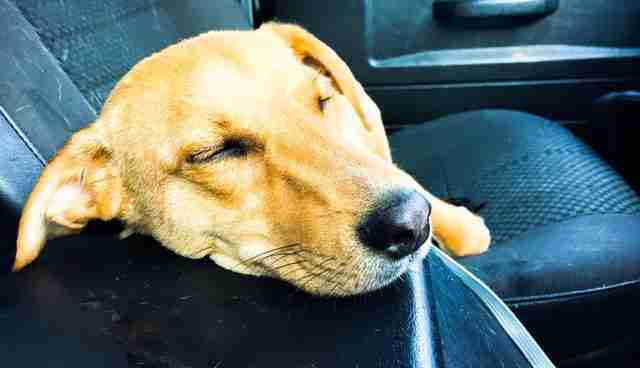 But when Stöckigt managed to coax him into the car, Bailey drank water and fell asleep. 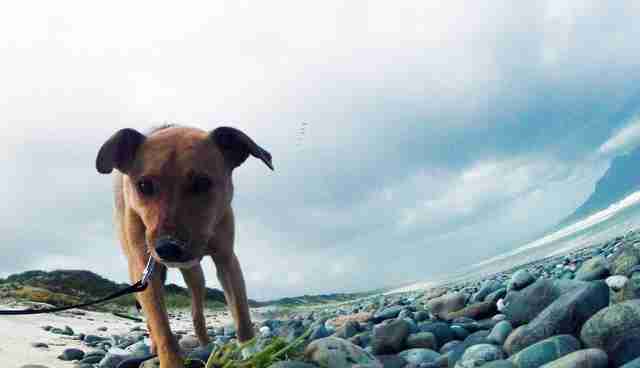 The beach trip must have brought Bailey luck, because a few days later, he found his forever home. "It's a great sense of relief that Bailey has finally found his true guardian," said Hanekom. 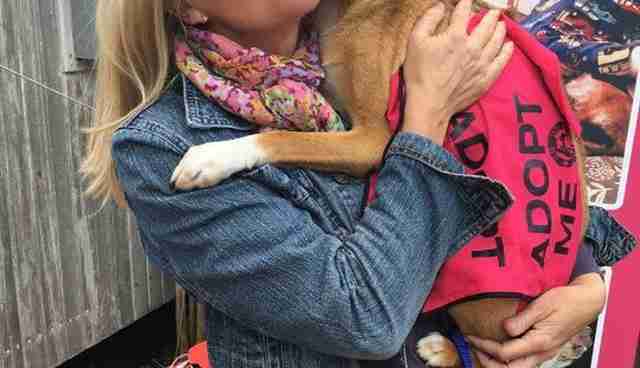 "When rescues are homed, it's a huge joyous occasion for us because that's their 'happy ever after.' It means no more hunger, no more fear, no more pain, no more abuse, no more uncertainty. 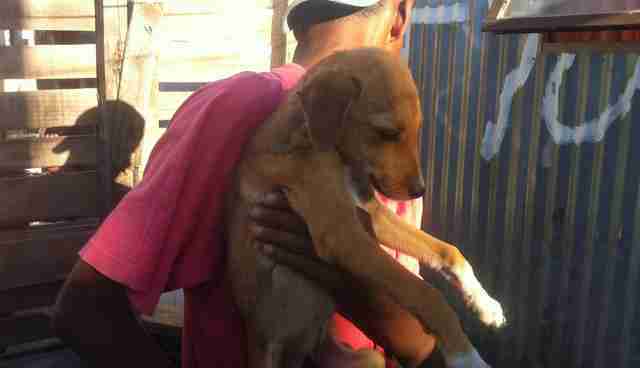 They belong and are wanted and loved and that is the main aim when an animal is removed from Blikkiesdorp." 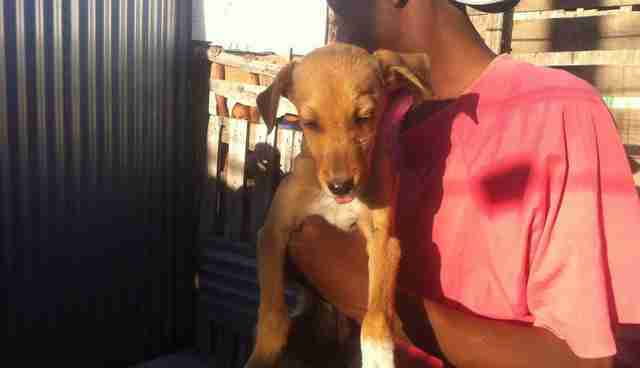 Tin Can Town offers humane, life-saving animal services to dogs and cats in Blikkiesdorp. The group also works to educate people on how to properly care for their companion animals. For more information, you can visit Tin Can Town's Facebook page and donate through its Paypal account.